The official Remain campaign, then known as Britain Stronger in Europe, now Open Britain, paid a £1,250 fine in 2017 imposed for not providing three invoices. Remain campaigners were then fined £19,000 for failing to declare their spending properly during the EU referendum campaign. At the same time, the Liberal Democrats were fined £18,000 by the Electoral Commission, near the legal maximum fine of £20,000, mainly for “failing to provide acceptable invoices or receipts for 80 payments”. No doubt there are other transgressions and infringements of the law to emerge. As for the Leave campaign, the scale of deception, fraud and cheating going on was completely out of control and it still is. The BBC Northern Ireland documentary about a secretive £435,000 donation given to the DUP’s Brexit campaign raised concerns not just about its legality but also about exactly where the money came from. The DUP received it from the Constitutional Research Council (CRC), a shadowy group led by Richard Cook, a former Tory candidate allegedly involved in illegal waste dumping. The ultimate source of the DUP’s Brexit cash has never been disclosed but much of it was spent with the same suppliers as Vote Leave. Then there was the case where Vote Leave dropped its appeal against the Electoral Commission’s ruling that it broke the law in a different way – by channelling hundreds of thousands of pounds of donations to BeLeave, another pro-Brexit campaign group. The official Vote Leave campaign, whose leaders included Boris Johnson and Michael Gove, has been fined multiple times and referred to the Metropolitan Police for breaking electoral law. In early 2016, Darren Grimes, a 21-year-old fashion student from Durham, set up a social media campaign to encourage young people to vote to leave the European Union. “BeLeave” raised the princely sum of £21.51 in three months. Two weeks before the Brexit referendum, Grimes received a series of massive donations, including one of £625,000 from the aforementioned Vote Leave campaign. This money, it was subsequently discovered, was paid directly to a Canadian data analytics firm called Aggregate IQ. Aggregate IQ was involved in the huge Facebook/Cambridge Analytica scandal where millions of voters were precisely targeted using ‘psychographic’ profiling – a military perfected system of algorithms designed to influence elections. It is unknown exactly how much money was spent here. One can only imagine it rolled into many £$millions. Pro-Brexit campaign, Leave.EU, was fined £70,000, again for breaking electoral law. Leave.EU was bankrolled by Arron Banks, a controversial businessman who emerged from obscurity to become the biggest donor in British political history, giving more than £8 million to pro-Brexit groups. His money and the source of it is still under investgation by the National Crime Agency. In January this year, the biggest UK political advertiser on Facebook was Britain’s Future, an obscure pro-Brexit group, which spent £31,000 in just seven days running more than 200 different adverts, mainly urging the public to write to their local MP and urge them to back Brexit. Britain’s Future also spent £88,000 on pro-Brexit adverts in three months. The group only hit the headlines when it was revealed it was the biggest single UK political advertiser on Facebook, spending £422,000 on adverts campaigning for a hard Brexit despite never declaring its financial backers. It turns out that almost all the major pro-Brexit Facebook so-called “grassroots” advertising campaigns in the UK share the same page admins or advertisers. These individuals include employees of CTF Partners and the political director of Boris Johnson’s campaigns to be mayor of London, who has worked closely with Crosby in the past. Leaked documents have revealed how CTF boasts of its ability to run fake online grassroots campaigns. The term “Chuck Chequers” came to life from here. In the end, they need money to operate and make a profit – where did the money come from? This is a potential corruption inquiry at the very heart of government and the Brexit movement because Boris Johnson, former Home Secretary is involved in both. One of Johnson’s associates includes Steve Bannon, himself involved heavily in the right-wing news outlet Breitbart London who also happened to be a director of Cambridge Analytica. To add more evidence to the Brexit crime scene, a Facebook page called We are the 52%, which spent more than £50,000 on pro-Brexit Facebook adverts emerged. It is fronted by a Conservative activist and former Vote Leave staffer Theodora Dickinson. The source of this money is unknown and Dickenson refuses to answer questions about it. No-one knows where the money has come from. And no questions are being asked by the authorities. Don’t forget what this money can do. £100 gets an advert on social media to hit thousands of targeted individuals. And just last night an investigation by Channel 4 News also reveals how Arron Banks’ pro-Brexit group appears to have staged photos of migrants attacking women in London and faked migrant footage of a crossing from France to the UK. The reality is that we simply don’t know how much money is being spent on pushing for Brexit. And we should not forget that this has all been uncovered by investigative reporters, not by the police, not by the National Crime Agency and not by the Electoral Commission. In another instance, Leave Means Leave, a group campaigning for a hard Brexit, had former Brexit Secretary Dominic Raab whose primary role was to oversee a successful Brexit on its political advisory board. This group is full of climate science deniers, is supported by the DUP, wants deregulation and has links to the extreme free market right-wing tea party. Is this somehow not a conflict of interest at the very least? Many of these examples are funded by organisations hiding in the shadows. They don’t want their identities known. If Brexit with all of its implications was so good and the evidence was there to support that, why aren’t they out in the open? Then there are the so-called think tanks and front charities. We simply don’t know how many hundreds of millions of dollars went into producing false reports and studies, how many of them were pumped out by the mainstream television media – in newspapers, magazines and online. Someone had to pay for it all, it wasn’t free. The line-up of this deception is enormous. From the so-called Institute of Economic Affairs – little more than a front charity, and political whore to right-wing free markets extremists with cash to flash to the Legatum Institute, itself funded by a foreign billionaire wishing to cash in on the chaos of Brexit. The IEA has been given little more than a slap on the wrist for its clear breach of duty as a registered charity. It has since been shown that there are dozens of shadowy think tanks from the USA involved in seeing Britain experience a hard Brexit. Again, their links to extreme free-market fundamentalists are well known, but the source of their money is not. We can add American corporations to the mix who see Brexit as a chance to cash in – a bit like the fossil fuel transnationals who see the Arctic ice melt as nothing more than a business opportunity. They secretly pump millions into yet more dodgy economic studies that try to reassure the people of Britain that Brexit will be the dawn of a new horizon. It won’t – they are lying and the economic evidence of that is all around us now we are many months into this failing project of self-harm. To top all this, crusaders from the so-called American ‘Christian’ right have made their way to Britain attempting to affect decisions of national importance and identity with all their bitterness and hatred. Everything from pregnancy and abortion rights to dignified dying is up for grabs apparently. Political attack dog operations have opened in London, Turning Point USA another ‘free-market’ mouthpiece for the corporations is spewing its bile across British university campuses. It’s pitiful to witness a country like Britain being deliberately deconstructed in a divide and rule theme park game for the ultra-rich. Whilst the British people were being hacked by dark money and American tech companies, in the background treasonous political betrayals and traps were being laid. Theresa May withheld crucial immigration reports that would have heavily influenced Cameron’s remain campaign. She did this purely for personal reasons no doubt. In the meantime, business leaders were secretly being threatened by government ministers such as arch Brexiteer David Davis for warning of the economic dangers of Brexit. To confuse an already dazed public – pollsters were actively deceiving them on referendum sentiment to profit from bankers and hedge funds who would short the currency and make millions overnight. Farage was caught doing the same. The instances of criminality is never-ending. 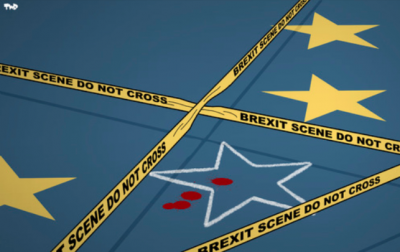 Brexit has turned out to be little more than a national crime scene. No sooner had the result been announced, American and British negotiators started working on the US/UK trade deal. That deal has been done and dusted, the negotiators have gone home – but it can’t be announced for legal reasons within the current EU framework. Make no mistake, Britain will be getting the very worst of what America produces in agriculture and the chemicals industry along with a whole array of new public health deceptions irrespective of what Brexit is delivered. And now, after one of the greatest propaganda campaigns in history, the great con that Britain swallowed whole, it appears that no-one will really be properly investigated, charged or locked up. For example – internal documents prepared by the Electoral Commission after the BBC Northern Ireland documentary reveal little appetite to investigate potential Vote Leave coordination in the DUP’s referendum spending. As Vote Leave had already been fined for a breach of electoral law after giving money to BeLeave “it would not, therefore, be in the public interest to investigate even if there was evidence of an offence”, the regulator said. Let’s not forget that the same dark money that went into these illegal campaigns could well have emanated from the proceeds of crime. Drugs, human trafficking, prostitution and terrorism are just some of the hallmarks of money laundering – itself a national pastime by the City of London who clearly did not want EU laws on tax havens to affect their ‘dark profits’. And the gangsters in the DUP, propping up Theresa May’s corrupt government turned a blind eye to its source, unquestioningly. The sources of this money, relating to the DUP has since been given the seal of secrecy by the state. It legislated against the public from ever knowing where the money came from. The only tangible legal defence of Britain against these lies over Brexit is a private prosecution against Boris Johnson for his part in deceiving the electorate over claims he very publicly made about £350 million a week going to the NHS as a Brexit dividend. Not only was this a blatant lie, but he also sought to capitalise on peoples fears over the NHS – fears they got from Johnson’s own Tory party who have been systematically tearing the service apart since they came to power. Hopefully, the judge will allow the case to be heard. Hopefully, Johnson will be found guilty, then thrown out of politics forever. It won’t happen of course because if Johnson is found guilty so will many other members of the Conservative party. So, what has been the response in Britain to all this crime? A parliamentary inquiry? Not likely – ever. This is because the largest Brexit campaign which broke the law many times was fronted by Conservative party members – hence why it has provoked hardly a peep from the party of government, themselves being willingly bludgeoned by the politically suicidal and demented free-market Jihadists – Rees-Mogg’s ERG. The Electoral Commission itself only looked in depth at Vote Leave after internal emails were released under Freedom of Information legislation. It showed that the watchdog was deeply uneasy about the campaign’s spending but was wary of launching a full investigation. We know why – because the entire system from top to bottom has proven to be democratically corrupt and unravelling that in front of the electorate would have profound consequences. Not a single new piece of legislation has been brought forward to protect Britain’s democracy from dark money and hidden spending, from deceptive charities and the lies of think tanks, foreign billionaires and billions of micro-targeted ads on social media designed by the US military to ‘change hearts and minds.’ Britain’s democracy is now for sale to the highest bidder and open to influence by crooks like Zuckerberg and his ghastly global propaganda and fake news distribution apparatus. All of this is a sure sign of capitalism eating itself from the inside out like a cancer. Britain is the host, Brexit is the tumour. There will be a general election sooner or later, maybe a second referendum – all rigged to the aspirants with the deepest pockets. We know this because it has just happened. This is not the rant of someone displeased the Brexit vote went the wrong way – this is a rant about the massive fraud that Brexit represents. The real truth is that from here, it is not possible to state that Britain is a democracy because it can no longer claim to be one. Brexit already took Britain to the cliff and when the state chose to look the other way, the nation was thrown over. Graham Vanbergen is the contributing editor of TruePublica, columnist for the European Financial Review and author of: Brexit – A Corporate Coup D’etat.